The Meeting of the Senior Officials of the 28th Session of the COMCEC was held on 8-9 October under the Chairmanship of Deputy Undersecretary of the Ministry of Development of the Republic of Turkey. During the Meeting, the delegations of the Member States and the OIC institutions considered and deliberated on a number of agenda items related to various issues of enhancing economic and commercial cooperation among the Member States. The issues include: Review of the implementation of the OIC Ten-Year Program of Action and the Plan of Action to Strengthen Economic and Commercial Cooperation among the OIC Member States; World economic developments with special reference to the OIC member countries; Recent developments in intra-OIC trade, the Trade Preferential System among the OIC Member States (TPS-OIC), Priority Sectors (agriculture, tourism and transportation) and exchange of views on the theme “Enhancing Competitiveness of SMEs in the Member States”; Financial cooperation among the OIC member countries: cooperation among Stock Exchanges, Central Banks and Capital Markets’ Regulatory Bodies of the OIC member countries; Poverty alleviation: Islamic Solidarity Fund for Development (ISFD), Special Program for Development of Africa (SPDA), OIC-Cotton and OIC-VET programs; Enhancing relations with the private sector. In addition to the presentation made by SESRIC on the Annual Economic Report on the OIC Countries 2012, the Centre also made presentations and briefed the Committee on the following agenda items: (1) Cooperation among the Central Banks of the OIC member countries; (2) Vocational Education and Training Programme for OIC Member Countries (OIC-VET); and (3) Results of the Questionnaire Circulated by the SESRIC to the Member Countries on the Proposed Themes for the COMCEC Exchange of Views Sessions. In their deliberations on all these issues, the Senior Officials discussed and considered the recommendations and policy implications of many technical and background reports prepared and presented by various relevant OIC institutions as well as those of some related international and regional organizations. They also prepared the Draft Resolutions on these issues for consideration by the Ministerial Meeting, which was held on 10 October 2012. 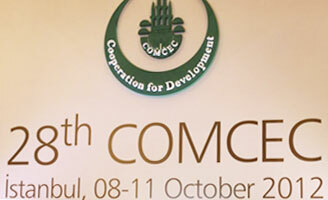 The Ministerial Meeting of the 28th Session of the COMCEC was held on 10 October 2012. The Opening Ceremony of the Meeting was held under the chairmanship of H.E. Recep Tayyip Erdoğan, Prime Minister of the Republic of Turkey. In welcoming the delegates, H.E. Erdoğan expressed his belief that COMCEC cooperation would achieve greater success in the years ahead. Pointing out the recent fluctuant and fragile global economy, Prime Minister Erdoğan stressed that the COMCEC Member States could contribute to the construction of a sound and stable world economy. He maintained that a more liveable and fair world could be achieved only through a collective action. He said that the advice of “The best of the people is the one who benefits people most” is the major factor leading the Islamic communities to take a global role. In addition, the rising position of the Member States in the world economy, and the growing demand of societies for human rights, the rule of law, transparency and accountability were the other leading factors. He said that it was possible for the Islamic countries to be in a more effective position in the world than in the past and that they had the required resources to play this role. H.E. Erdoğan continued his statement by describing the recently adopted COMCEC Strategy and expressed his belief that the Strategy would ensure the COMCEC to achieve a new vision and a more implementable framework that would increase the effectiveness and visibility of COMCEC. H.E. Erdoğan said that the new Strategy is based on three principles namely, enhancing mobility, strengthening solidarity and improving governance. H.E. Erdoğan stressed that the strategy introduces a well-defined project cycle management clearly identifying the project processes from submission to implementation. H.E. Erdoğan stated that for the implementation of the COMCEC Strategy, the Member States should play a central role and the secretariat services should become more effective and professional. H.E. Erdoğan, touching upon the recent developments with regard to the priority sectors of the COMCEC, namely agriculture, tourism and transport, expressed his satisfaction with the progress achieved in these fields. Following the Inaugural Statement made by H.E. Erdoğan, OIC General Secretariat, the Heads of Delegations of the State of Kuwait, the Republic of Gabon and the Islamic Republic of Pakistan on behalf of the Arab, African, and Asian regional groups, respectively and president of the Islamic Development Bank (IDB) delivered statements at the Opening Session. The Opening Session continued with launching ceremonies of the S&P OIC/COMCEC Index and the COMCEC Strategy for Building an Interdependent Islamic World. The Ministerial Working Session was held afternoon under the Chairmanship of H.E. Dr. Cevdet Yilmaz, Minister of Development of the Republic of Turkey. Following the adoption of the Agenda, the Country Gateway Office Agreement was signed between the Republic of Turkey and the Islamic Development Bank. Following this signature, the Session was briefed on the outcome of the Senior Officials Meeting. Following the presentation, the Ministers exchanged their views on the theme “Enhancing the Competitiveness of Small and Medium Sized Enterprises in the Member States”. Mr. Sergio Arzeni, Director of the Centre for Entrepreneurship, SMEs and Local Development of the OECD, and Mr. James Zhan, Director of the Investment and Enterprises Division of UNCTAD, made presentations as keynote speakers. Afterwards, the Ministers discussed various aspects of the subject and elaborated on ways and means of developing the competitiveness of SMEs as well as COMCEC cooperation in this area. The Closing Session of the 28th Session of the COMCEC was held on 11th October 2012 under the Chairmanship of H.E. Dr. Cevdet Yilmaz, Minister of Development of the Republic of Turkey. Rapporteur of the Senior Officials Meeting summarized the proceedings of the Senior Officials Meeting and highlighted some salient points in the Resolutions. The Session adopted Resolution OIC/COMCEC/28-12/RES. At the end of the Ministerial Meeting of the 28th Session of the COMCEC, H.E. Dr. Cevdet Yilmaz, Minister of State of Turkey, delivered a closing statement. H.E. Yilmaz expressed his satisfaction with the successful conclusion of the 28th Session of the COMCEC. He pointed out two projects that were launched during the Session. Firstly, he said that he attached particular importance to the new COMCEC Strategy, which would be very instrumental for creating a common understanding and approximating policies among the Member States. He underlined that it brought a country-driven COMCEC and aimed at easier movement of goods, capital and people among COMCEC countries. Secondly, he touched upon the launching of the S&P OIC/COMCEC 50 Index, expressing his belief that this Index would be a trademark worldwide and would be very instrumental in addressing the growing demand for Islamic financial instruments. H.E. Yilmaz concluded his statement by thanking all participants and extended his best wishes of health, happiness and prosperity for all the peoples of the brotherly Islamic countries. Among many resolutions, 28th Session of COMCEC welcomed the initiative of the Certification and Accreditation Programme for the Professionals of Official Statistics, developed by the OIC Statistical Commission (OIC-StatCom), and requested the IDB and SESRIC to contribute technically and financially to the effective implementation of this important programme for the benefit of the National Statistical Institutions of the Member Countries. The Session also welcomed the initiative of SESRIC for organizing capacity building programmes in the area of agriculture and food security in collaboration with the Ministry of Food, Agriculture and Livestock of the Republic of Turkey.